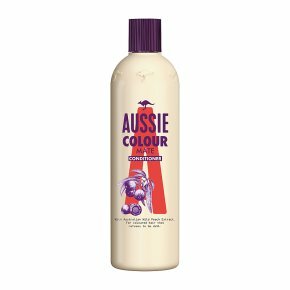 Aussie Conditioner Colour Mate special formula, with extract of Australian Wild Peach, helps keep coloured hair vibrant and in great condition. Your hair-colour's best mate. Australian Wild Peach kernels were first used as a form of hair conditioning oil by the indigenous Australian people and now we think they're worth bringing half way across the world. For optimal results, use with Aussie Colour Mate Shampoo. Keeps your coloured hair in tip-top condition, as vibrant as you are. It smoothly conditions the hair, leaving it as brilliantly vibrant as you are. With Australian Wild Peach extract. For vibrant, coloured hair that refuses to be dull.Got a rad colour you want to protect? Then send dull packing with our conditioner formula for coloured hair, with Australian Wild Peach extract. It smoothly conditions the hair, leaving it as brilliantly vibrant as you are. So why wild peach kernels? Well they were first used as a form of hair conditioning oil by indigenous Australians, and we jumped on the bandwagon of brilliance! Well, it would've been rude not to.